Puff pastry can be tricky to work with and needs to be treated with care and respect to ensure good results. By following a few simple guidelines you can have perfect puff pastry every time. The keys to ensuring that you get crisp, flaky layers from your pastry are concerned with temperature and handling. Pastry should be at room temperature for rolling (to make it more pliable), but chilled before baking (so the buttery layers remain separate). A hot oven allows the layers to rise, but needs to be monitored to prevent burning. When handling, a floured worktop is essential, as is a sharp knife for cutting to shape. Overworking will make the pastry tough, but leaving the pastry too thick will make it hard to cook all the way through. Here we give a guide for rolling and cooking puff pastry on its own; if using it as part of a recipe (for example in a pie), you may need to alter the cooking instructions according to the recipe but the preparation principles remain the same. To save time, you can buy ready-rolled pastry sheets rather than using a block of pastry or making your own. These should be brought to room temperature before using, so that they do not split or crack when unrolled. Unroll and cut to shape as desired, then chill again before baking. Glaze and bake as above. If using the puff pastry as a base for a tart, lightly score a 1cm border around the edge of the pastry using a sharp knife. This will help the border to rise when baked and create a raised edge for the fillings in the middle. If the puff pastry is to be used for topping pies or stews, you could lightly score a pattern on top of the pastry to act as decoration. This will also help the pastry rise along the score-lines and create a little more texture and flake. 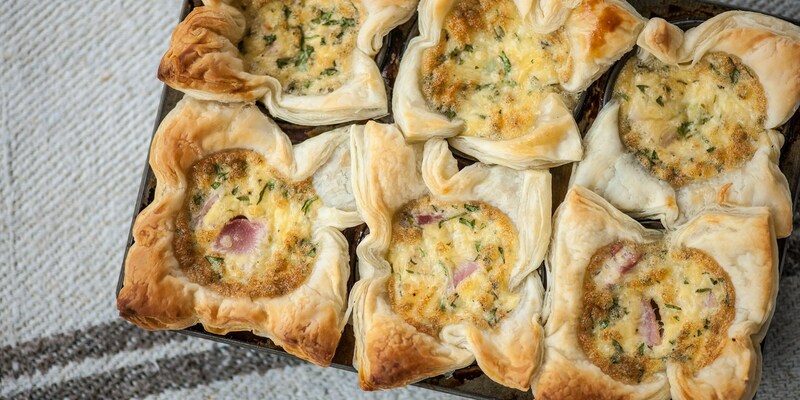 Puff makes a great addition to a main course, you can make something simple like Puff pastry pizzas or wow your guests with a Pithivier of chicken, squash and sage. Learn How to make the perfect pithivier using puff pastry. For dessert you could try the classic tarte Tatin, Marcello Tully makes a delicious autumnal pear and walnut version, or you could try Andy Waters Spiced pineapple puff ring tart. Another traditional puff pastry dessert is the Mille-feuille, for a special occasion try our recipe for a Mille-feuille of peach and raspberry with a citrus cream.